Huntley High School sophomore Kyle Ockerlund and fellow members of the Experimental Science Society, a student club he co-founded, always keep their ears open for new ideas to research. So when an upgrade to the school’s security system altered the tone of the school’s class bell, he heard the call loud and clear. “It was a Monday morning, and without warning, the bell rang, and it was a higher pitch,” Ockerlund says. He says other students took note, but since the bell rings mainly at the beginning and end of class periods, not many felt a strong need to sound the alarm about the change. However, for Ockerlund and other students in advanced courses such as AP Chemistry, which span two regular class periods, hearing the higher pitch in the middle of class was disruptive. “That’s when I decided to see if this actually [caused] a decrease in concentration,” he says. He worked with teachers to get permission to conduct a series of studies in freshman advisories, giving students simple concentration tests while playing either the new or old bell sound. His analysis found, at a 0.1 level of significance, that the new sound did lead to statistically poorer performance on the tests. He alerted the administration to his findings, and he says, they not only listened to his concerns but immediately began looking for ways to change the bell sound. As a high school underclassman, Ockerlund suspects he would have a difficult time getting his research published in an outside journal, but he has considered submitting it. While he cautions that the results are limited specifically to the particular environment and population of HHS, the subject of student concentration is frequently looked at in the field of education research. He has some experience in that area, having recently authored and published a book on TI-BASIC, the programming language used on Texas Instruments graphing calculators. 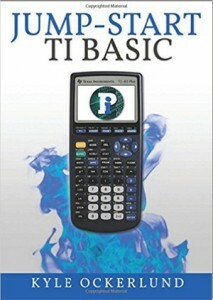 The book, Jumpstart Ti Basic, is available for purchase through Amazon. Writing the book was another outlet for his intellectual curiosity—a quality he encourages his fellow students to embrace. He noted that students at HHS are fortunate to attend a school where a culture of innovation is embraced by both students and staff. Read more and listen about Ockerlund in the Daily Herald, WBBM Newsradio, WBEZ’s Morning Shift and FOX 32 Chicago.